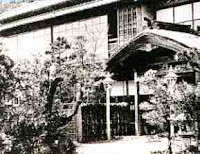 ...1895 (115 years ago today), the Treaty of Shimonoseki entered into force, weeks after it was signed at the Shunpanrō Hotel (right) (credit), in the treaty's namesake Japanese city. By this pact, which ended the 1st Sino-Japanese War, China "recognise[d] definitively the full and complete independence and autonomy of Korea." Furthermore, China ceded many territories to Japan, among them the island then known as Formosa, now Taiwan.